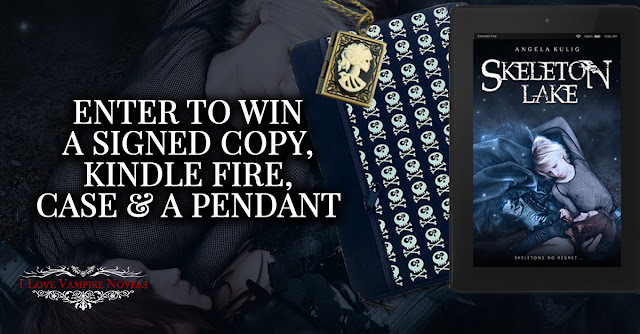 Angela Kulig: More Awesome Prizes Than You Can Shake a Book At! I know you guys like to win things, here is the second giveaway up for the month of October! AND.... it's a wild one! The giveaway is over on I Love Vampire Novels; which yes does more paranormal besides blood drinkers. You could win all this awesomeness AND MORE! Plus, everyone who enters will get their very own FREE copy of The Skeleton Song when the giveaway is over. Is this an awesome giveaway or WHAT? Leave some love, then go enter and tell your friends!